Get a year of our excellent magazine sent to your door with the code BQUICK. You can save 24% off a subscription to our long-running magazine for today only. Just head here, and use the code BQUICK at checkout to save a hefty 24% on all subscriptions, print and digital. This offer has been extended until 3PM today—October 3rd. If you're in the US mainland, that gets you a year's subscription to the US magazine sent to your door for just $18.24. Get exclusive features, hardware coverage and more in your mail every month. 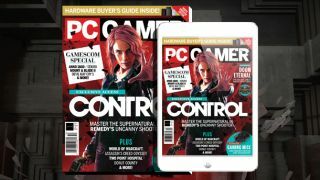 If you're in the UK, you can use the code BQUICK to get a year's subscription for only £52.44. The UK print edition is longer at 130 pages, is printed on larger paper and comes with download codes every month. In the current edition, for example, there's a Steam key for the card game Faeria, which usually retails for £19. It also comes with exclusive subscriber covers every issue, like this beautiful thing.